These days, norms governing Non-Resident Indian (NRI) real estate investments in Indian realty have been eased. Therefore, more and more NRI investors are showing interest in Indian real estate investments. However as an NRI, to ensure that everything related to your real estate investment is in place you need to know about property documentation. This knowledge is crucial to avoid all disputes related to property. 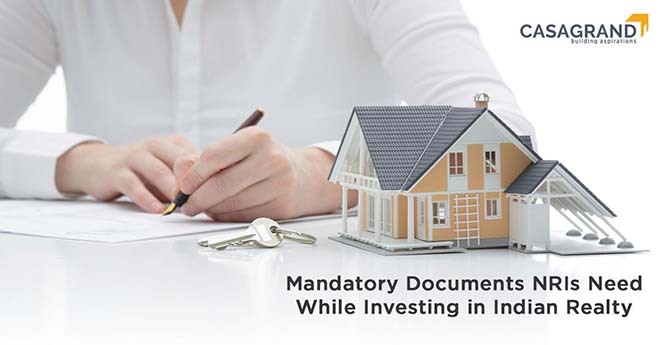 We have compiled a list of necessary documents that NRIs require for buying or selling properties in India. One of the most important documents that you must have to purchase a property in India is the Indian passport. However, if you hold a passport of a foreign country, then you need to have a Person of India Origin (PIO) card. If you are an individual who is not an Indian Citizen but eligible to become an Indian citizen, i.e. if one of your parents is an Indian, you will need an overseas citizen of India (OCI) card. You can apply for the OCI card in the Indian embassy of the country you live in. As you will be expected to file income tax returns for your investment in India, you must definitely have a permanent account number (PAN) card. You can get PAN card easily in India by applying for the same online. As you are an NRI, you need to assign a power of attorney for all your investments. Having a reliable power of attorney will help in getting registration, execution of the sale, possession, and other processes done easily and quickly. Think wisely before choosing your power of attorney, prepare a clear power of attorney certificate with the help of a lawyer, and get it signed by your power of attorney and witnesses. You need to keep this document safely. When you are planning to sell your properties in India, apart from the documents mentioned above, you will need the following. If you created any wealth out of the property you bought, i.e. by renting or leasing it out, your income becomes taxable. In such cases, the tax returns for the whole property-ownership period must be kept handy. When selling properties, it is advisable for NRI investors to have their address proof, like ration card, electricity bills, voter ID, etc., for both their Indian as well as their overseas address. The sale deed is the most important document needed in the property selling process. Considered as the primary proof of ownership, this legal document is an agreement executed by you while purchasing a property in India. If you are selling a flat that is part of an apartment, society, or a gated community, then you need to have a letter of allotment from the concerned society bestowing the house to the buyer of your property. Apart from the letter, you must also get a document from the society that states that there are no outstanding payments by you to them. A copy of the approved building plan is mandatory for selling properties in India. Also, have the occupation certificate handy. This certificate is a document issued by a local government agency or building department certifying a building’s compliance with applicable building codes and other laws, and indicating it to be in a condition suitable for occupancy. No matter you are selling a villa, an apartment, or even land, an encumbrance certificate is necessary. This certificate assures the buyer that the land or the property has no dues to any legal authority. We hope, by now, you have a fair idea about the various documents that you must have in order to buy or sell a property in India.